TORONTO -- The people of Toronto should have a voice when it comes to the size of their local government, Mayor John Tory said Friday as he called on the province to hit the "pause button" on a controversial decision to cut the size of city council just two months before a municipal election. Premier Doug Ford has called Toronto City Council dysfunctional, and his Progressive Conservative government introduced legislation last week to reduce it to 25 seats from 47. In a letter to Ford, the mayor said the decision should be put to a "binding referendum." 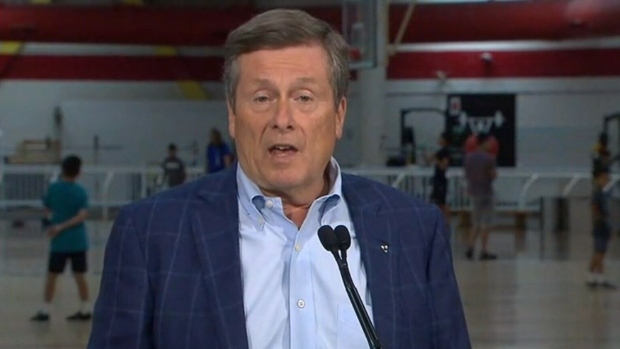 "I have made my own position clear -- it is unacceptable and unfair to change the rules in the middle of an election," Tory said in the letter made public Friday. Tory said the province should allow a question about the proposed council reduction to appear on ballots in the Oct. 22 municipal election. Other reforms such as term limits could also be considered at the same time, he added. In the letter, Tory argued that "hitting the pause button" on the decision is a sign of strength, and urged Ford to consult more broadly on the plan. "I would respectfully suggest that the legitimacy of your government's position dramatically increases if supported by a legitimate process," Tory said. "It is always better to do something right as opposed to doing it quickly." The letter also noted that the city has requested advice from its lawyers on the potential for a constitutional challenge of the province's legislation. Ford said in a statement Friday that his government's plan will help council make decisions and deliver services "more efficiently and effectively." "An oversized council makes it almost impossible to build meaningful consensus and get things done," he said. "As a result, infrastructure crumbles, the housing backlog grows and transit isn't built." Ford, a failed Toronto mayoral candidate and single-term city councillor, has said he has wanted to make the change since his days at city hall despite not mentioning his plan during the spring election. But he said in his statement that he consulted with "thousands of people" during the campaign "who feel that in its current form, Toronto City Council is dysfunctional." "I have always championed the idea of reducing the size of council in order to deliver better government for the people of Toronto," he said. Critics have decried the move as undemocratic, slamming the premier for rushing the proposed legislation through without consultation. The opposition New Democrats have attempted to delay the bill this week with a series of procedural moves designed to draw out debate and give Toronto politicians more time to fight the decision. NDP House Leader Gilles Bisson said the Ford government has tried to scuttle debate of the bill in the legislature and shut down the chance for public consultations. "We will continue fighting like hell to allow people to have their say in what happens to their local representation," Bisson said in a statement. "We will do whatever we can to stop Doug Ford from silencing the voices of the people in the middle of an election."